The rotator cuff consists of muscles and tendons that hold the shoulder in place. 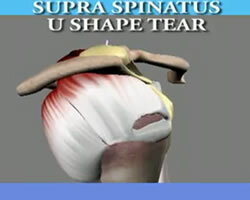 It is one of the most important parts of the shoulder. The rotator cuff allows a person to lift his/her arms and reach up. An injury to the rotator cuff, such as a tear, may happen suddenly when falling on an outstretched hand or develop over time due to repetitive activities. Rotator cuff tears are also due to aging. The symptoms of a rotator cuff tear may resemble other conditions or medical problems. Always consult your physician for a diagnosis. X-ray – diagnostic test which uses invisible electromagnetic energy beams to produce images of internal tissues, bones, and organs onto film. Magnetic resonance imaging (MRI) – a diagnostic procedure that uses a combination of large magnets, radio frequencies, and a computer to produce detailed images of organs and structures within the body.